I originally saw this suggestion in a blog entry by Melissa Cole, shortly before Christmas. Pete Brown also mentions something similar in his book "Hops and Glory" (see page 50). With easy access to both the cheese and beer (at Borough Market), and with it being Christmas, I thought ... why not. First, the beer. The colour is a deep copper-brown with, in the words of Pete Brown "its live yeast creating a mini cumulonimbus of dense foam at the mouth of each freshly opened bottle". The smell is all spicy English hops with some sweet caramel and alcohol notes. The taste starts with caramel, toffee, malty sweetness and moves on to the spicy hops. The beauty of this beer, for me, is in the balance. The cheese is an authentic Cheddar, nothing like the imitation stuff you get in supermarkets. It starts off creamy, milky, smooth and subtle. It then grows into a tangy, mustardy, peppery and earthy finish. The closer your mouthful to the outside of the truckle, the more intense the flavour. Together, these two are perfect. The sweet, malty flavour in the cheese compliments the creamy sweetness in the beer. The spicy hop finish in the beer straddles the mustardy, peppery tang of the cheese. Well worth the effort to track down and try these two together. Harmony! Since trying these, I've also tried a homebrew English IPA with some cheaper authentic mature Cheddar. Whilst it doesn't quite hit 11 in the way that the above did, the combination is still great. Excellent post, Chunk. 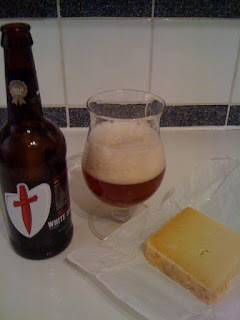 I was thinking about how well beer goes with cheese (better than wine imo) the other night whilst tucking into the Scammonden Dark (Brupaks kit) and some Tesco's finest emmental. That sounds delicious too. My favourite thing at the moment is a beer, some strong cheese and fresh bread. Quite agree, probably the same reason that, if you cut the dough instead of ripping is when you're making rolls they don't rise as well. Did you get a brew on this weekend? I've got a Coopers IPA with Amarillo and a Brewferm Gold on. I wanted to but couldn't. All of my kit is back at the parents house (still there from Christmas brewing). The plan was to transport it back to me this weekend but the snow sort of killed that off. I'm also almost completely out of pale malt. I've made a Coopers lager before and it was terrible. Not sure if I fermented it too hot but it's the only brew that's been a drain pour for me so far. What's the IPA like and did you dry hop it with Amarillo? The only thing is that I may have overdone it slightly on the hops as the tights are floating in spite of being weighed down with a stone and a couple of rubber bungs. Sounds very good indeed. Maybe take them out a bit sooner than planned, if you think there's too much? I love the smell of Amarillo though, lovely hop. Do you get all of your ingredients from the web? I've noticed there's a distinct lack of homebrew shops down in Kent (with the exception of one I found in Maidstone). Great pairing. IPA and cheddar is fantastic. Double IPA and extra mature cheddar is like a super-sized version of the pairing and really good too. I'm a huge cheese and beer fan. I love opening a couple of bottles and a few cheese and just getting stuck in. One of the best I've had recently was at the Guild of Beer Writers dinner which was goats' cheese wrapped in smoked venison served with duchesse de bourgogne. Brilliant. Better than the sum of its parts.